BELOW YOU WILL FIND SHIPPING INFO FOR OUR REGULAR WHOLESALE ORDERS! UPS and USPS are used whenever possible. However "Common Carrier" can be selected in special cases. For all US orders we offer two shipping options. *Please note all expedited orders will be processed and shipped the same day unless the order is placed after 12:00 PM Pacific Time. The day the order is shipped does not count as one of the shipping days. (3day select option) If order is placed before 12:00 PM Pacific Time - the package is actually delivered on the 4th business day from the day you place the order. (3day select option) If order is placed after 12:00 PM Pacific Time - the package is actually delivered on the 5th business day from the day you place the order. Canada orders will be shipped as soon as the orders are confirmed and usually delivered within 14-21 business days. All orders placed after 12:00 PM Pacific time will be processed the following day. Hawaii and Alaska orders will be shipped via USPS. Hawaii shipments may take an extra day due to time changes. International shipping is currently available WORLDWIDE from ccwholesaleclothing.com. Most international orders are shipped with USPS (priority mail/parcel post or first class mail ) international packages can take up to 14 - 21 days for delivery. 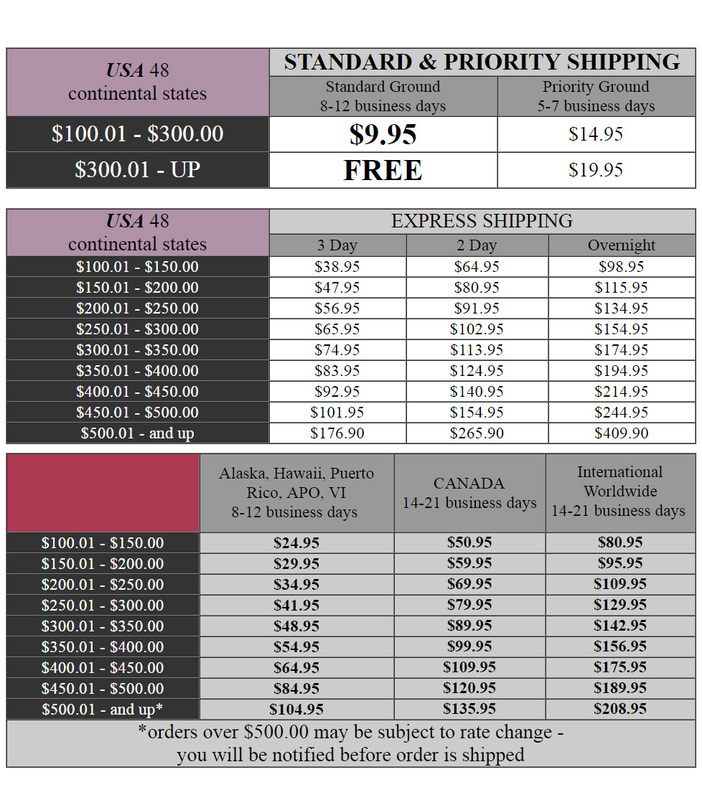 By placing an order at ccwholesaleclothing.com, you are responsible for original shipping charges, all applicable custom import fees and the cost of return shipping back to ccwholesaleclothing.com. This also applies to any shipments that are refused by you at delivery. All international sales are final no returns or exchanges.